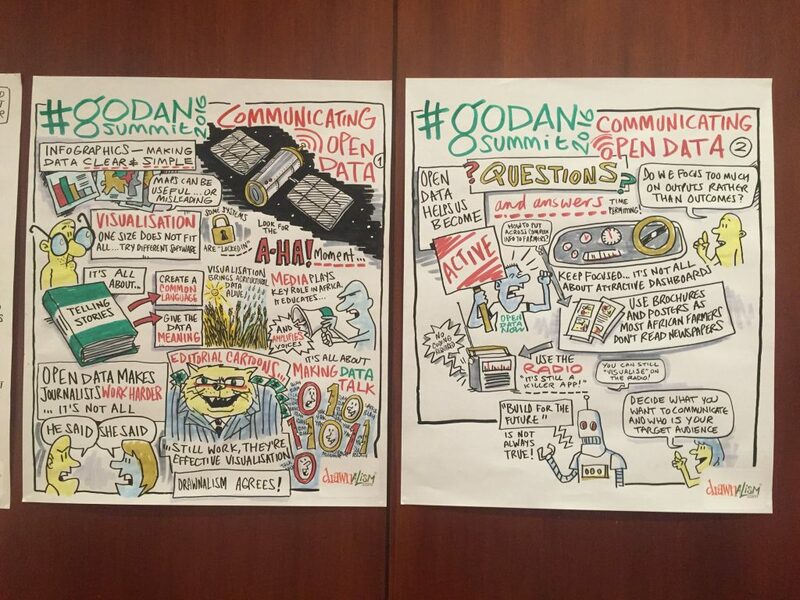 Agriculture and nutrition open data, especially its role in supporting progress towards the achievement of SDG2, formed the central theme of this year’s GODAN Summit in New York city. It was a rich experience bringing together like-minded individuals and organisations working towards improving agriculture to end hunger and extreme poverty around the world. It was a multistakeholder gathering that also included public sector actors who are not based in their agriculture ministries. An artists representation of the discussions in one of the GODAN 2016 sessions. A very encouraging sign as we believe anything short of a whole-of-government effort to transform agriculture won’t do. There were 3 key points that I felt signal the importance of bringing a whole-of-government approach to agricultural transformation in Africa. Beware of the data divide – the asymmetry of capacity to analyse and gain financial benefit from open data. Sufficiently resourced systems/frameworks for gathering, analysing and disseminating data and evidence on the sector’s transformation. Availability of data is vital to these seven areas and of course opening up this data plays a big role in all driving progress. However, the role of open data will always be that of a supporting actor and it will never play the lead. With lots of open data on agriculture but insufficient investment, poor policy, low human capital, poor business environment, expensive credit etc there can be no meaningful progress. But if all those are in place and the data isn’t open our problems would take a very different shape. Our narrative therefore needs to locate open data at the right place within our broader priorities related to transformation of agriculture in Africa. Open data on its own will be hampered by capacity and literacy asymmetries and farmers would therefore not realise any gains from it. One of the reasons I found the GODAN Summit a rich experience is because of the pragmatism that accompanied the conversations on open data that have been the staple of those working on transparency and accountability over the last 5 years. The recognition that data for decision-making in the sector is key and that it should be opened is grounded in the pragmatic implementation of interventions to address challenges in the agriculture sector. In my view, the first part of that statement, “Decision making is evidence-based”, recognises the imperative for strong institutions capable of implementing the developmental agenda of the state whilst being grounded in evidence. The second part, “…and the evidence shared”, recognises the need to make it available to all stakeholders and deliberately address the challenges of the data divide through the right partnerships, investments and a conducive political environment. Embracing this approach is therefore not simply a matter of rhetoric but is a statement of action which Kenya’s agriculture ministry is making progress towards with explicit commitments e.g. the implementation of a National Agriculture Information System by December 2018. Bringing a whole-of-government approach to the implementation of the agricultural transformation agenda is vital and in one way, Sierra Leone has demonstrated how that can play out. The Universal Service Fund tends to be under the Ministry of Information or the telecommunications regulator but the government of Sierra Leone is ensuring the capacity challenges related to the data divide in agriculture are addressed by leveraging the fund as a mechanism to support this. The Sierra Leonean government is therefore bringing to bear upon the data divide resources from the Universal Service Fund and demonstrating one way through which integrated thinking on agricultural transformation can deliver real value. Prev:Comprehensive Source for Agriculture Data on Africa Launched.